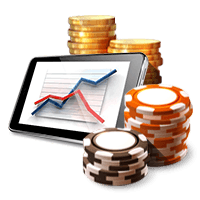 Online casino bankroll management is an important part of any player's successful gaming strategy. When you're gambling your bankroll is the one thing that you can control. Players cannot influence the outcome of the roll of the dice, spin of the wheel, or flip of a card. They cannot do anything to make a game of chance end differently. All they can do is take responsibility for how they use their cash at the casino. Here are some important tips concerning how to manage your online casino bankroll. They will help you get the most from your cash. Following them will serve you well at the gaming tables and slot machines. Online casinos offer players various bonuses and promotions by which they may get what is sometimes called “free money.” Although free money is rarely free, it can help you get more from your bankroll. The most common types of bonuses are first deposit and reload. A first deposit bonus, which is sometimes misnamed a sign up bonus, is awarded to a player after they make their initial deposit. The reload bonus is awarded to those who make subsequent deposits after making their first one. As an example, if you make a deposit at a casino for $100 and they offer a 100% match, you'll receive $200 in your account. Such an offer may include the need for the player make a minimum deposit of $50 for the bonus to apply, and bonuses may be restricted to deposits of up to $300. In order to withdraw any winnings a play-through amount will be stipulated. If it is 10x the total of the deposit and bonus, then you would need to make $2,000 in wagers before you could withdraw any winnings. The thing to remember regarding any bonus is to use the free money wisely. It can give you additional opportunities to win. Online casinos may also offer promotions, which may included awarding double chips, the ability to earn double points and extra bets, a return of bets on certain types of losses, or a free bet for trying out a new feature, such as the online casino's mobile betting APP. Promotions are designed to encourage wagering, which means you should approach how you access them wisely. You can also add more power to your bankroll by not utilizing any freerolls or free bets offered. 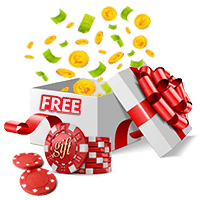 Freerolls, which usually have some prize or award associated with them, are often accessed through a promotion code. Examples of how codes may be made available include announcements through the casino's social media sites, various forums, or a special mailing. Free bets may be given out as part of another bonus deal, when you play a certain game, or if you use a specific feature for the first time. Free rolls and free bets really are “free,” and they are great deals for players. 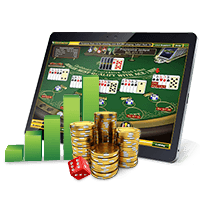 Online casino bankroll management involves setting limits as to how much you are willing to lose over a specified amount of time. A common limit would be no more than 5% to 10% of your bankroll. The point of doing this is to extend your playing time over the course of as many days as possible. You also need to set limits for when you win money. Too many online casino players will be ahead, and then they continue playing, losing all of their winnings and then some. Always remember that eventually any losing streak you are enjoying will be accompanied by losses. Set a reasonable limit based on a percentage of your stake. If you decide the percentage is 10% and your betting limit for the day is $50, you would stop playing once you were ahead by $5.00 or more. If your limit is 20%, then you'd end your playing when you had won $10.00. Smart players control how much they bet by breaking their bankroll into units. If you have $300 in your account and you divide it into $1.00 units, you would have 300 betting units. A rule of thumb dictates that you would use no more than 15% of your bankroll in a betting session. In this case that would be $15.00. If playing blackjack or other such games, $15.00 would give you 15 bets at $1.00 per bet. If playing a $0.25 slot, you would have 60 turns. Once the cash it used up or once you are ahead, you would stop playing for that day. Units also allow you to budget your cash over longer amounts of time. If you want to play at your online casino 5 days a week for the entire month on $300, then your daily limit would be based on 5 days x 4 weeks = 20 days. Dividing $300 by 20 days gives you a daily limit of $15 per day. As a note, if you wanted your cash to last 30 days, your daily limit would be $10.00 per day. Along with setting limits on how much you're willing to risk per day, another way to make sure you don't take any big losses is by walking away from the casino. Too many people get transfixed on the game they are playing and continue taking turns even though they are exhausted. The result is they rack up big losses. Learn to walk away and play another day. If you have never played a certain game, slot, or variation of a game, then you should first try it in the free play mode. Most online casinos allow players to bet play money on their games. Taking turns using play money lets you experience the game and learn how it works without risking a cent. Then, when you start betting real cash, you'll have a better idea of how much to wager and in what manner you should play. 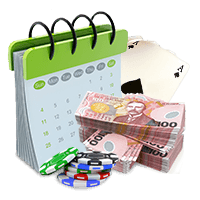 Games such as keno and big six or games that have side bets, or special wagering opportunities, such as “craps any seven,” come with a high house edge. Staying away from these games and bets will help to control your spending. Games with low house edges, which include blackjack, baccarat, European roulette, and Pai Gow Poker, should be played instead. Betting systems, such as the Martingale, Fibonacci, and d'Alembert, do not work and should be avoided. The one thing that these systems are guaranteed to do is to eat up your bankroll. Such systems are based on the Gambler's Fallacy, which is the belief that each time you lose a bet it increases the likelihood that you will win the next one. However, for this to be the case, one turn of the roulette wheel, roll of the dice, turn of slot reels, or flip of a card would be connected to the next. They are not. They are separate events and the outcome of one does not influence the outcome of the next. If you think you are going to turn $100 into $1,000 in one-hour by betting at your online casino, then think again. You could increase your bank by 10 times its value, but probability says it's not likely. If your bankroll is $100, then its reasonable to expect a 10% to 20% increase or loss in value over one week if you are playing according to the bankroll management methods outlined above. Remember that there are no guarantees when it comes to online casino play and that good money management techniques will help keep you in the game longer.